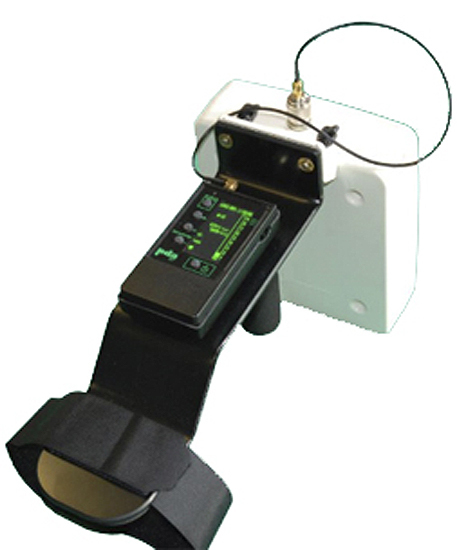 The WM8 antenna system is designed to enhance the detection capabilities of the CPD197 mobile phone detector. The lightweight assembly (approx. 600grams) allows operators to accurately pin point the location of an operational phone. The detection characteristics also allow the unit to reject unwanted signal reflections from other sources. The antenna effectively amplifies the signals being supplied to the CPD197 thereby increasing the range of the unit by as much as 50%. The assembly can be used, either with the handle or mounted on the operator’s forearm. The WM8-197 was designed specifically for use in prisons and can greatly increase the detection capability. In situations where multiple mobile phones are in operation on a wing at the same time, it can be difficult to identify the cell containing an active phone simply by using signal strength alone. The assembly can be strapped on the officer’s forearm who can then simply walk passed cells on each landing /level. The CPD197 will then indicate which cell(s)have active phones in them. Once activity has been detected on a wing the assembly can be setup to monitor specific parts of the wing from one end over a period of time. The WM8 assembly greatly improves the detection and location capabilities of the CPD197 by reporting direction as well as signal strength to search team. With a line of sight range in excess of 500metres for 2G registration signals, the WM8 can be used to identify which accommodation block contains an active phone. On approaching the block the antenna system can help quickly identify which part of the block the phone is actually located in.